Volatility roared back into American equity markets, as the S&P 500 Index sank 4.1 percent to wipe out its January gain and turn lower on the year. The index capped its worst day since the U.S. lost its pristine credit rating, topping the rout that followed China’s shock devaluation of the yuan, the Brexit selloff and jitters heading into the presidential election. Trading volume was almost double the 30-day average. All but two stocks in the broad gauge declined. “This is classic risk off that may not end any time soon,” says Win Thin, head of emerging-market currency strategy at Brown Brothers Harriman. Selling accelerated shortly after 3 p.m. in New York, with the Dow sinking more than 800 points in a matter of 15 minutes only to snap back. The blue-chip index ended lower by 4.6 percent — its steepest drop since August 2011, and is also lower for the year. The Cboe Volatility Index more than doubled to its highest level in 2 1/2 years. Monetary policy decisions are due in Australia, Russia, India, Brazil, Poland, Romania, the U.K., New Zealand, Serbia, Peru and the Philippines. The S&P 500 fell 4.1 percent as of 4 p.m. New York time. The Dow fell 1,178 points, or 4.6 percent, while the Nasdaq averages were off by more than 3.7 percent. 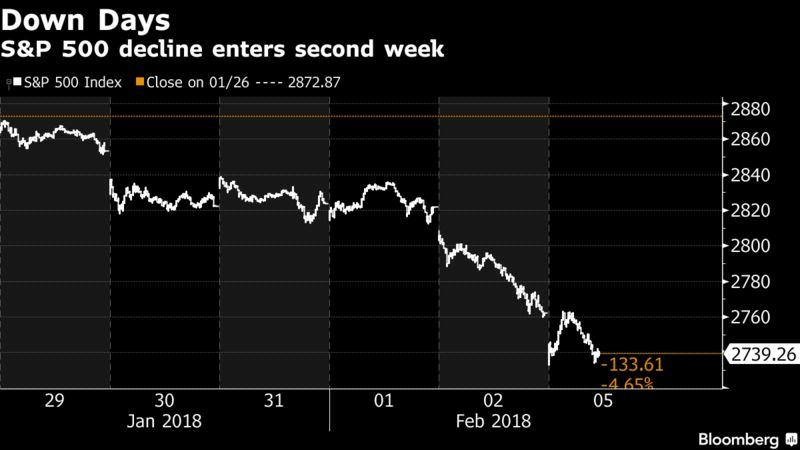 The Stoxx Europe 600 Index declined 1.6 percent , hitting the lowest in almost 12 weeks with its sixth consecutive decline. The MSCI Emerging Markets Index lost 1.9 percent. The Bloomberg Dollar Spot Index gained 0.3 percent. The euro decreased 0.5 percent to $1.2405. The British pound declined 0.8 percent to $1.4001, the weakest in almost two weeks. The Japanese yen gained 0.3 percent to 109.79 per dollar. The yield on 10-year Treasuries fell four basis points to 2.81 percent. Germany’s 10-year yield declined three basis points to 0.74 percent, the largest decrease in almost six weeks. Britain’s 10-year yield declined two basis points to 1.558 percent. West Texas Intermediate crude dipped 2.2 percent to $64.01 a barrel. Gold advanced 0.1 percent to $1,334.76 an ounce. Copper gained 1.8 percent to $7,169 per metric ton.